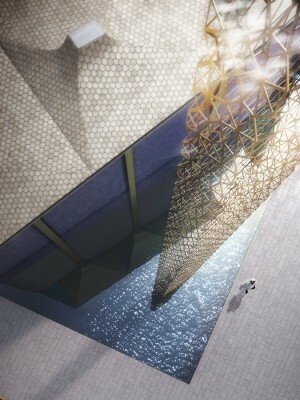 London-based architecture practice AL_A has won an invited competition to design a new mosque in Abu Dhabi. 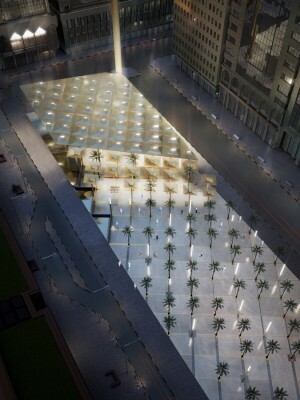 The Mosque is part of the World Trade Center developed by Aldar Properties, one of the largest developers in the Middle East and North Africa region. The practice’s proposals see the new 2,000m2 mosque and park as an escape from the immediate context of the vertiginous steel and glass of the World Trade Center and provide a focal point of worship for its inhabitants. “The Mosque is envisaged as a piece of the city, one that reflects the journey from the temporal to the spiritual. Set within a park, the mosque and the garden become one, with the trees and the columns forming an informal vertical landscape and allowing Friday prayers to spill outside. The World Trade Center Abu Dhabi, designed by Foster + Partners, is a 700,000m2 fully integrated mixed-use facility comprised of offices, residences, a mall, a souk and a hotel. This news follows on from last week’s announcement that the practice’s new kunsthall for MAAT, a new Museum of Art, Architecture and Technology in Lisbon, will open to the public on 4-5 October 2016 with a commission from French artist Dominique Gonzalez- Foerster. AL_A have conceived the Mosque not as a building but as a pathway, a journey that takes people from the tumult of everyday life to serene order. The design evokes that pathway and becomes the transition from the temporal to the transcendent – a narrative sequence expressed through architecture that links the spiritual to the everyday. Visitors’ first impression is of an informal park landscape of trees and columns. Traversing the park, the trees and columns align, a grid emerges and an axis becomes apparent as people are guided towards the Mosque. Once inside the axis shifts towards Mecca. The columns have a directionality that reconciles the move from the urban grain of the park to the serene grid oriented towards the qibla. 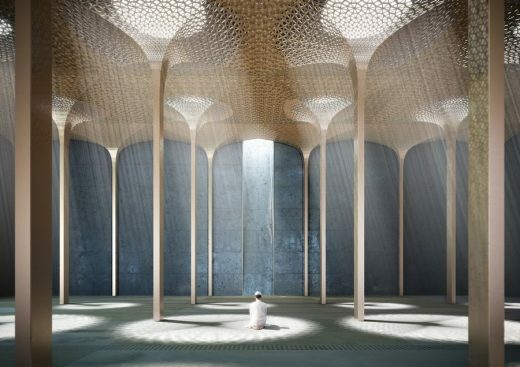 The prayer hall creates an intangible presence of something that goes beyond its physical form with an atmosphere sculpted by light and peacefulness. The Islamic architectural tradition of arches is played out in the rhythm of the structure, which has a slenderness and finesse achieved only through modern techniques and materials. The surface of the columns is inspired by the rich tradition of Islamic geometrical patterns. The pattern of perforation on the columns is designed using a bespoke computer script to vary and control the amount of light entering through the roof structure. The play of light and shadow animates the space and activates the senses. In this way, an aspect of Islamic tradition is revealed through twenty-first century technology. The park is imagined as a pastoral escape from the immediate context of the vertiginous steel and glass of the World Trade Center. This subtle transition between inside and outside, between architecture and garden, between worship and daily life reflects on the spiritual and emotive nature of the project. The roof is designed as a landscape to be viewed from the surrounding high rise buildings. The minaret signifies the Mosque’s presence in the wider landscape of the city. Ethereal, delicately perforated and self-supporting, it is dislocated from the roof yet formed of the same proportions as the columns that constitute the rest of the Mosque.